Light, tender brioche doughnuts dipped in a rich chocolate ganache sprinkled with toasted chopped pecans then drizzled with a sweet, gooey caramel. 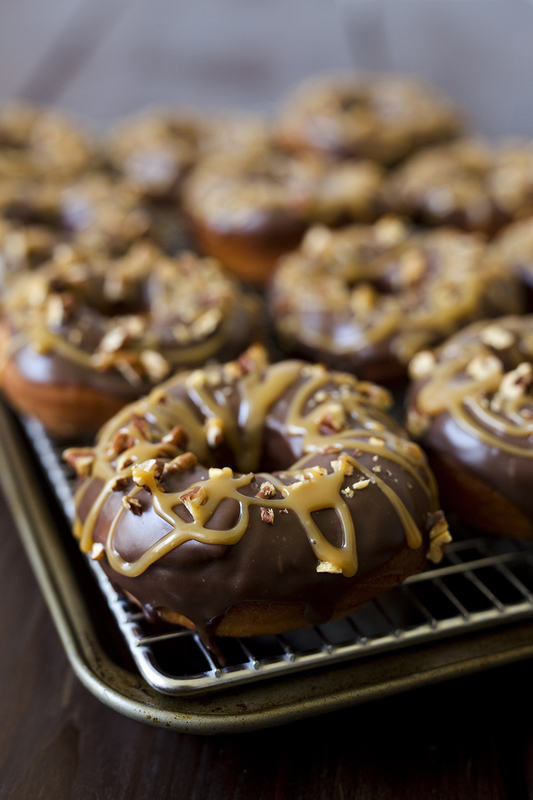 The flavors of a turtle chocolate candy in an irresistible doughnut. Mix 2½ cups flour and yeast in mixing bowl, using the paddle attachment, on low for about 30 seconds. Heat milk, butter, sugar, and salt in a small saucepan over medium heat until butter is melted, sugar is dissolved and milk is between 120° to 130°F. With mixer on low, pour in liquids and mix until incorporated. Add eggs; beat 3 minutes at medium speed. Switch to the dough hook and mix in the remaining flour a little at a time, to make a soft, slightly sticky dough, add more or less flour as needed. Knead the dough for 5 minutes. On a well-floured surface, roll out dough to ½-inch thick. Cut out dough using a 2½-inch donut cutter or pastry ring and using a ⅞-inch ring for the center whole. Set on floured baking sheet. Cover with plastic wrap and let rise until double, about 30 minutes. While the doughnuts are rising, make chocolate glaze. In a glass bowl, microwave heavy cream, butter, and corn syrup just until it starts to boil, about 45 seconds. If necessary, stir until the butter is completely melted. Add chopped chocolate and whisk until chocolate is melted and smooth. If necessary, microwave an additional 15 seconds at 50% power. Set aside to thicken. Preheat the oil in a deep fryer or Dutch oven to 375°F. Carefully place the doughnuts into the oil, 3 or 4 at a time. Cook for 1 minute per side until golden brown. Transfer to a cooling rack topped with paper towels. Allow to cool for 15 to 20 minutes before glazing. Dip the doughnuts in the glaze and put them back on the cooling rack glazed side up. Sprinkle with chopped pecans. Allow glaze to set for 30 minutes . Caramel Drizzle: Heat caramels and heavy cream in a microwave safe bowl on 50% power, stirring every 30 seconds, until melted and smooth. Drizzle caramel over the chocolate glazed doughnuts.